The Free Animation School: 11: Even more on design. 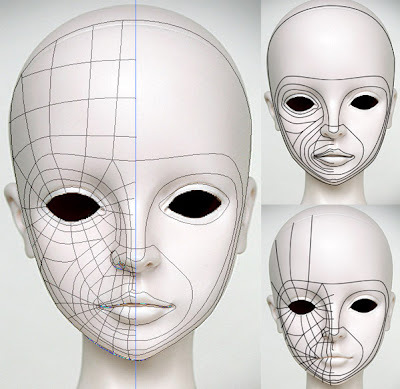 It may seem like I am going on and on about the design aspect of 3D character model building. But the fact is, a badly designed model is a real pain to animate with. You may as well get it right the first time and build a great model and your expertise rather than clumsily fix a bad model. When considering your characters you should be thinking about how they deform as they move and be designing to allow for those movements. The way to do this is with a well defined edge loop design. Edge loops are a design principle that allows for light weight poly models and maximum deformation flexibility. In this really easy to follow tutorial about edge loops Athey Nansel-Moravetz explains how to go about designing your characters to have good edge loop integration. The idea being that you will be able to create guide images to load into your front and side views in Blender and build your mesh to suit the design. Here again you can see a nicely planed edge loop layout in this body for a Street Cop in this tutorial by Mashru Mish. He has evenly spaced the edges and kept the joint quads divided at the bend these are the key edges. Also there are support quads and edges called fills that are closer to the bend. These are placed around the key edges in order to stop deformation flowing too far up or down the leg and arm joints.